A brief introduction on the different types of in-car accessories available! Recent years have seen an explosion in the number of “in-car” accessories that have become available to the average motorist. The advent of DVD (“Digital Versatile Disk”), MP3, and GPS (“Global Positioning System”) technologies means that entertainment systems can now include favourite films, and computer games, in addition to more traditional audio systems, and drivers can take advantage of satellite navigation, and speed camera detection, systems. 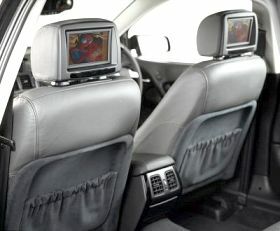 DVD players intended for in-car use are generally of two types - truly portable DVD players, which can easily be fitted, and removed, for security purposes, and those which form an integral, permanent, or semi-permanent part of the car, with, for example, screens incorporated into seat headrests, and permanent connections to the audio system. In either case, such systems can provide hours of entertainment, particularly for younger passengers - in the form of films, or computer video games - without any distraction to the driver, or front-seat passenger. The Philips PET707/05 Portable DVD Player, for example, features two, 7-inch, TFT ("Thin Film Transistor") LCD ("Liquid Crystal Display") screens, whilst the Sony MV65ST DVD Player features a 6.5-inch, swivel screen, and support for MP3, CD-R, and CD-RW, in addition to DVD. Satellite navigation systems - using signals received from a "constellation" of GPS satellites orbiting the earth to pinpoint the position of a vehicle in relation to its surroundings - are becoming increasingly popular, and, again, can be divided into removable, and more elaborate, permanent, systems. Satellite navigation systems can be very useful if you travel often, for work, or pleasure, or to destinations somewhat "off the beaten track", calculating the "best" route, subject to your preferences, and recalculating that route in case of accident, or other delay. A wide variety of products is available, from a number of different manufacturers - TomTom and Garmin amongst some of the better known - and these vary in the style of guidance (icon, voice, or both), the number of computer voices, the number of maps, and the type, and quantity of storage space, provided. Consider, too, if the antenna included with any system is adequate, particularly for driving in urban areas. Another application of GPS, of course, is its use in the detection of roadside speed cameras, not least, nowadays, because there are more than 600 speed cameras in the UK. GPS speed camera detectors rely on a database of camera locations, and can provide details of the camera type, its range, and speed limit in operation in the vicinity. The InfoRad GPS V3 Speed Camera Detector, for example, provides coverage for the whole of the UK, and most of Europe, and requires no installation, plugging directly into a cigarette lighter socket.